Over the next couple posts, Daniel will share information about prehistoric penguins. Learn more about penguins, their ancestors, their physiology and their biology. Visit the Aquarium! 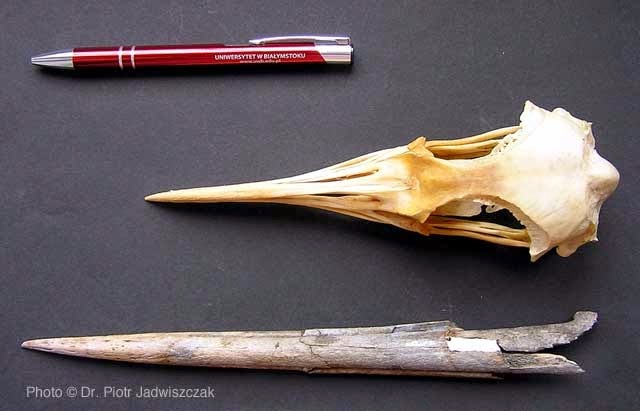 Keep reading for more about the first penguins in the fossil record in Antarctica. Antarctica was the first point of expansion for penguins. However, this was not the Antarctica we know today. There were no permanent ice sheets covering the continent, and forests spread over the land. Mountains rose over lakes and rivers, and vast plains spread over areas that today lie silently under tremendously thick layers of ice. 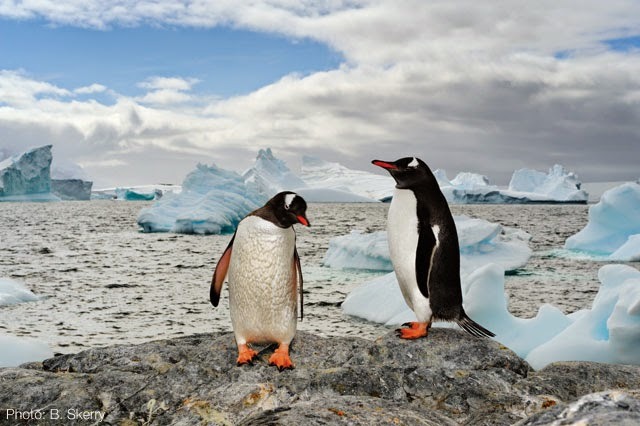 Sometime around 55 million years ago, shortly after penguins appeared in New Zealand, they expanded their range and reached this forested Antarctica. Soon, an incredible diversity of penguins was gathering along the coast at Seymour Island on the Antarctic Peninsula, which was once the site of an estuary. 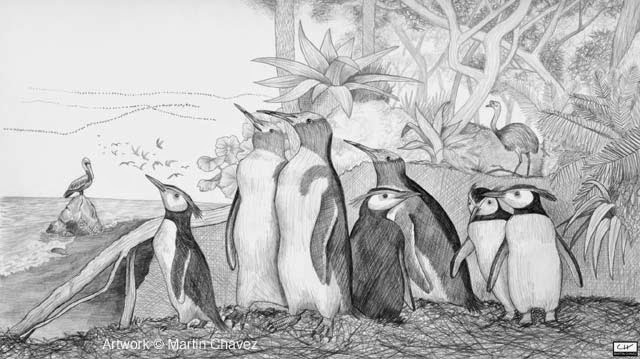 A gathering of penguins along the shoreline in Eocene Antarctica, with contemporary plants and animals. It is sometimes difficult to tell whether two different sized bones belong to separate species or represent the male and female of the same species. In the case of Antarctica, even the most conservative counts would indicate 8 species lived side by side, and the true total may have reached 12 or more at the height of their diversity during the Late Eocene (roughly 35 million years ago). These ranged from “normal” penguins close in size to the modern Antarctic Adélie Penguin all the way up to giant species like Anthropornis nordenskjoeldi (a name meaning Nordenskjöld's man-bird, referring to both an Antarctic explorer and the enormous size of the bird). King Penguin (Aptenodytes patagonicus). Photo © Dr. Piotr Jadwiszczak. Over time, Antarctica began to cool as it was placed in a freezer by changing ocean circulation patterns. Australia and South America, once connected to Antarctica, drifted further north opening a deep seaway. Surrounded on all sides by a powerful clockwise circulating current, Antarctica was cut off from warmer ocean waters and entered an icebound phase. Penguins today call the ice shelves of Antarctica home, and even lay their eggs and raise their chicks on frozen sea ice. Yet, today's polar penguins are not direct descendants of the many penguin species that lived in Antarctica during the Eocene. Those species are all extinct now, yet we know precious little about what happened between the Eocene today. All we have to fill in the more than thirty million year gap are two bones deposited 10 million years ago on the east side of the continent and found during field work in the region. We know that penguins like the adorable Adélie and the regal Emperor eventually mastered the ice, but it will take further discoveries before we know when they arrived and whether any survivors of the warmer era where still hanging on to survival at that point.